Super Mario All-Stars may be coming to the Wii in the form of a “Super Mario Collection” to celebrate the 25th anniversary of everyone’s favorite mustachioed plumber and Nintendo’s enduring mascot. This information was leaked via a retailer briefing that Nintendo held in Japan where they announced that a “Super Mario Collection Special Pack” (the name of the Japanese version of Super Mario All-Stars, probably NOT coincidence) was coming for Wii along with some nice extras in celebration of Mario’s 25th anniversary. The extras would include a special collector’s booklet that gives the entire history of the Super Mario series called “Super Mario History 1985-2010”. It would include lots of concept art and never-before-seen development material for fans to peruse. Also included would be a soundtrack CD with tunes from the entire series, stretching from the original Mario Bros. (or even Donkey Kong maybe, where Mario was originally referred to as “Jumpman”) to Super Mario Galaxy 2. 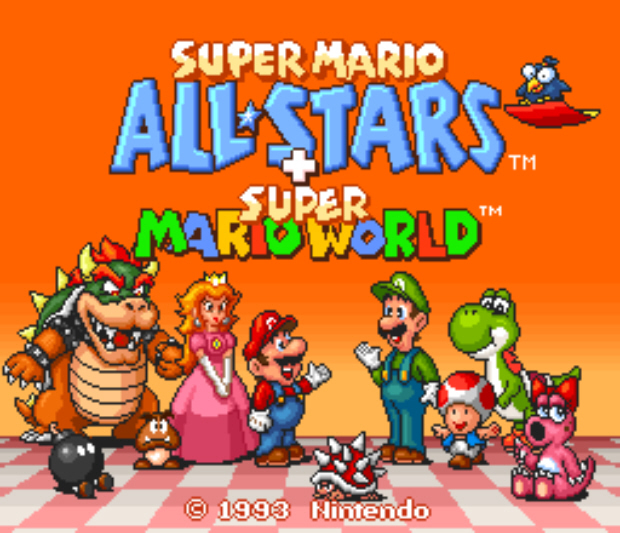 It’s presumed that the games contained on the Mario Collection disc would mirror at the very least those of the original Super Mario All Stars. If true they’d include: Super Mario Bros. 1, Super Mario Bros. 2, Super Mario Bros. 3 and Super Mario Bros: The Lost Levels. It also would hopefully include Super Mario World. It’s my hope though that they include lots of other wanted titles from throughout Mario’s history. What about including Super Mario RPG and Super Mario Kart? How about giving the fans what they want and including Yoshi’s Island? (one of the most requested Wii VC titles). What about including the entire Super Mario Land series including Super Mario Land 1 and Super Mario Land 2: Six Golden Coins? Heck take this occasion to update the classic Mario Land series with revamped graphics! That’d ensure everyone would buy it. Personally, I think people are more likely to buy it if they include one of the games I mentioned, but very unlikely to give it a serious look if it just contains games they already own in likely more than one version. The Super Mario Collection will apparently be released soon in Japan and would be priced at a reasonable $30. There are no indications if Nintendo plans to release it outside Japan. This is a rumor keep in mind although it’s pretty much been verified that it’s happening through retail leaks, but it hasn’t been officially announced or confirmed by Nintendo yet. Though i wouldn’t be surprised to see it pop up as part of Club Nintendo.